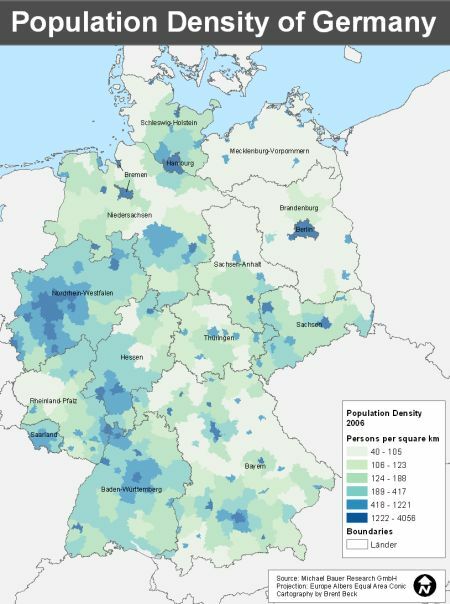 Population of Germany - Where live the most German people? How many people live in Germany? Which areas are densely populated? What are German people like? This page about the population of Germany reveals some statistics, but also facts about the main metropolitan areas, and secrets about my fellow German people. Approximately 82,5 million people live in Germany (30.09.2016). It is the most populated country in Europe, and the 14th in the world. Approximately 9 Million (11%) German citizens have an immigrant background. The largest group of ethnic Germans comes from Russia and other countries of the former Soviet Union. Germany has the third-largest Jewish population in Europe, many of them also came from former Soviet republics. 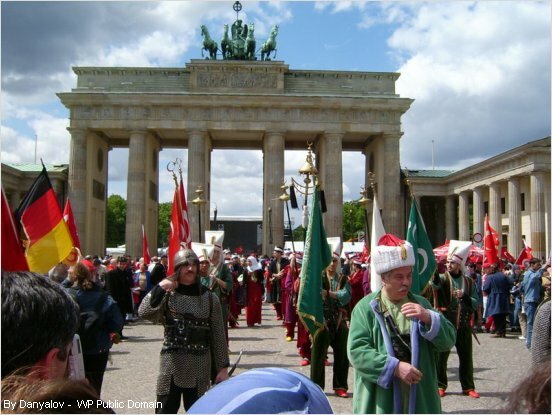 About 10 Million (12%) foreigners live in Germany, the Turkish people are with 1,5 million by far the largest community, followed by Serbs, Italian, Polish and Greek. In the early 1960s West Germany's economy grew significantly. Due to the resulting shortage of workers in the industry, "guest workers" (Gastarbeiter) from the Turkey, Yugoslavia, Italy and Spain were allowed to come to Germany. These guest workers were considered to stay and work for a few years, and then return to their country of origin. Some did, others stayed here, and had their families followed. East Germany also had a guest worker program with people mainly coming from East European countries, Asia and Africa. In the past decades, the German populaton has been decreasing, and getting older. Political parties have been discussing that an immigration program is needed to invite skilled workers and scientists to Germany. In 2016 about 1,6 Million people searching for protection (refugees and asylum seekers) were registered in Germany. It takes time to handle so many applications. Time will tell how many applicants receive refugee status, how many will move on to other countries or have to return to their original country. Although there has been tremendous help from volunteers, local clubs and social charities, it will take time and a lot of effort to integrate so many people. Numbers of new arrivals in Germany have slowed down in 2016 and 2017, but not so much on the European borders in Italy and Greece. There is a lot of conflict, not only in Germany, but in many European countries as well, when it comes to find agreements on how to distribute refugees across Europe. The population of Germany has changed and has become more diverse since the 1960s, and this will continue. Basically, not a bad thing, in my opinion. Getting to know different cultures broaden one's mind. Furthermore, citizens of the European Union have the right to live and work in any country within the EU, so the internationalisation of the population of Germany might increase in the future. The average number is 230 people per km2 for the entire country. However, as you can see on the map, population density varies significantly from east to west. There has always been an east-to-west movement since the 19th century. At first, people from Prussia and Silesia (German territories at that time) went to the Rhine-Ruhr area to work in the steel mills. Then, after WWII, Germans fled from these eastern regions (which then became part of Poland and Russia) to Germany. The east to west migration continued until 1961, when the Berlin Wall was built, and the last possibility to escape from Eastern Germany was closed. After the wall fell in 1989, many people from the east moved westwards, mostly for economic reasons. Also, within East and West Germany citizens moved from rural areas to the cities. The map below gives you a good overview where people live. Check out the German States page to see how many people live in each state. Roughly 32 Million people live in these 5 metropolitan areas. Although it has only approximately 650,000 inhabitants, Frankfurt is Germany's most international city. After all, Frankfurt is the economic and financial centre of Germany, and home of the European Central Bank Headquarter. Hence Frankfurt's nick name: Bankfurt! 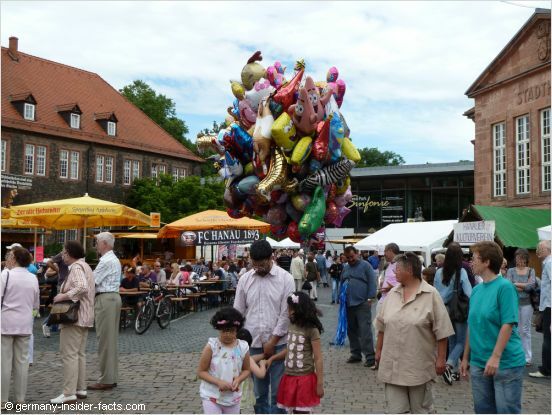 See my page about Frankfurt attractions to read more about this thriving city. In the age of globalisation, I wonder how many people in Europe and around the world believe that the typical stereotypes about Germans are true? Fact is that Germans are not the homogeneous society you might think it is. Many Germans identify themselves with the state they live in, and there are many differences in culture. For example, many Bavarians are proud Bavarians rather than proud Germans. Certainly, a few clichés bear some truth. However, can the well-known stereotypes still be applied to more than 80 million people? Let's have a closer look! What do people think is typical German? "Germans always wear Lederhosen" - That's not even true for Bavaria, the home of the Lederhosen. Lederhosen and Dirndl are a traditional dress (Tracht) of Bavaria. Other states have their tradional dresses as well. 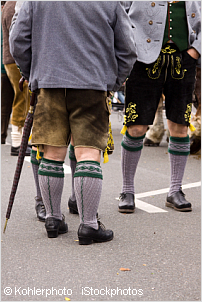 German people wear these Tracht at local festivals and events, sometimes. But usually not in everyday life. "Germans live on sauerkraut and sausages" - Well, sauerkraut is a healthy food. Depending on how you cook it, it can be very tasty. I like it. However, apart from sauerkraut, we have much more typical German foods. Would you believe that many Germans love pizza, spaghetti and Asian dishes, too? "Germans are always punctual, hard-working and don't have humour" - That was probably true in the 1950s and 60s. But the world has changed, and so have the Germans. I don't know if there is such a thing like typical German humour. But rest assured, we have a sense of humour! And we laugh a lot. We Germans love Dinner for One, a British comedy sketch. It is the most repeated TV program in Germany, it is broadcasted on New Years Eve by several TV stations. So we must have humour :). Punctuality is not a negative attribute, as long as one doesn't get mad at people who are a few minutes late. "Germans are unfriendly and impolite" - There is a degree of truth in this. Sometimes I think that as well, especially when I return from a holiday in a foreign country. Obviously, Germans have never learned to be patient standing in a queue, and to wait until people get out of the bus, before they jump in. Another situation when German people might appear unfriendly is when they are asked for help from a foreigner in English, or any other language. Although English is taught at school, many people hesitate to speak English because they are not fluent in English. Especially older people don't have good English skills. I could add a few other points about what I don't like about my fellow Germans. However, would this be representative? On the positive side, visitors are offered great hospitality. German people won't smile all day. However, if they treat you friendly, you can be sure they mean it. I received the following message by Graham from Norwich in England, he slightly disagreed with above statements. I really like all the information you provide on your website & newsletters. I also like visiting Germany. We tend to get away from the "beaten track" & I try my best to speak as much (admittedly bad) German as I can. I would like to report that, contrary to the stereo-type you identify as Germans being impolite without a sense of humour, I've found completely the opposite! Virtually everyone is polite helpful and clearly enjoys having a good hearty laugh! You're welcome to report that on your site! Please note: Statistics about the population might not be up-to-date, although I try to update stats every so often.